RPG is a genre which is well appreciated on all platforms by almost every gamer. We've all played RPG at some point and we've loved it from the very first moment. RPG games allow you to become a character, walk in someone else's shoes. What I like most about RPG games is the fact that you don't play the game because of stunning graphics or well-mechanized combat, you play the game because of the storyline, to find out what's next. RPG games mostly have a very strong and immersive storyline and often the choices you make decide how the story will end. You not only play the game but also write your own story. 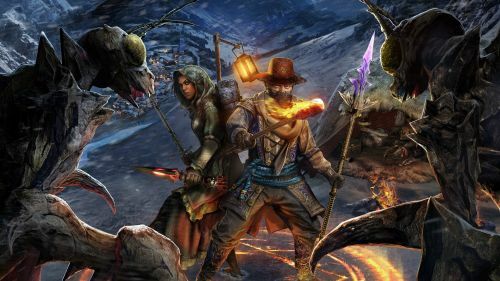 Outward is an open world RPG game mixed with survival gameplay. Explore the world of Aurai but be careful, the cold of the night or an infected wound can be as dangerous as a predator waiting for you in the dark. Outward offers you a lot more than just RPG game, the stunning visual of Aurai will heal your eyes but don't forget the world is equally dangerous. You're an ordinary adventurer in the game and just like other mortals, you are threatened by more than just the deadly creatures lurking in the dark. You need food to survive, water to stay hydrated and fire to stay warm. You need to protect yourself from the predators and the deadly atmosphere. Protect yourself from the creatures and make sure you are getting enough sleep. Go on your adventure and explore new cities, vast lands and dungeons full of enemies. In order to stay alive, you need to be brave but more importantly, you need to be clever. Protect yourself from the predators and don't forget your basic needs. Basic human needs like sleep, food, and water need to be maintained and lack of those can be the reason for your death. Play solo or join a friend in Co-op, the game allows both LAN and online multiplayer option.